This recipe is dairy-free, whole30-friendly and vegan optional. 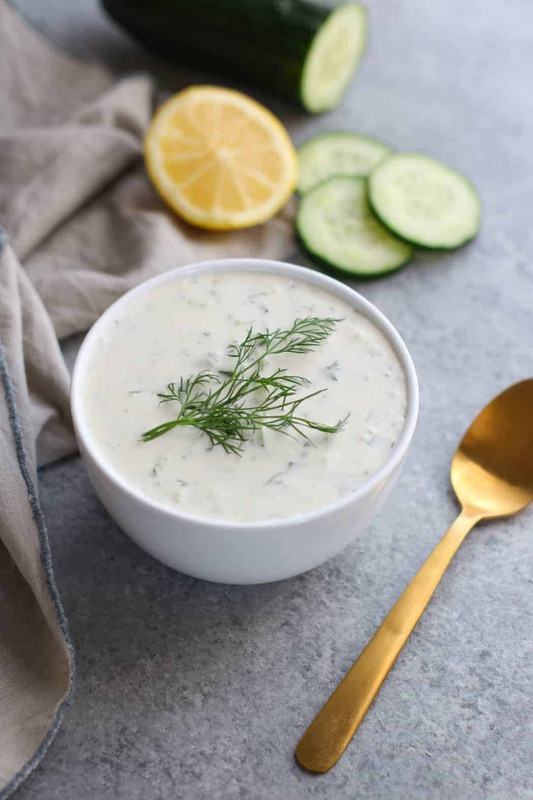 Paleo Tzatziki Sauce is a garlicky and flavorful sauce that’s made with just 6 simple real food ingredients. You know us, we’re all about simplicity here! 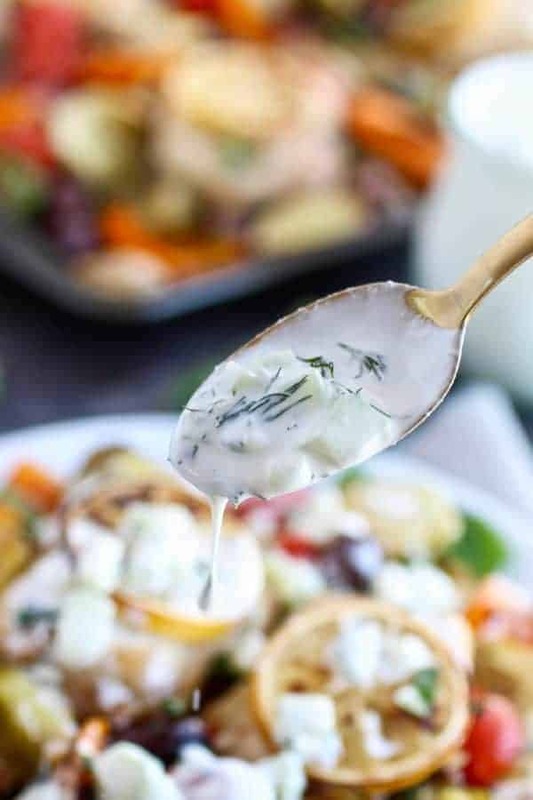 Tzatziki is a mediterranean Greek dish that’s traditionally made with yogurt, cucumbers, garlic, lemon juice (or vinegar) and herbs and is served over grilled meats or as a dip for pita bread and veggies. The perfect accompaniment to your Greek inspired meals! To make it paleo, Whole30 compliant and dairy-free, I combined full-fat canned coconut milk and mayo to take the place of the yogurt. However, if yogurt is your thing you can certainly keep it traditional and make it with plain yogurt instead. Move over Ranch! 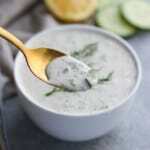 Paleo Tzatziki Sauce is in the house! 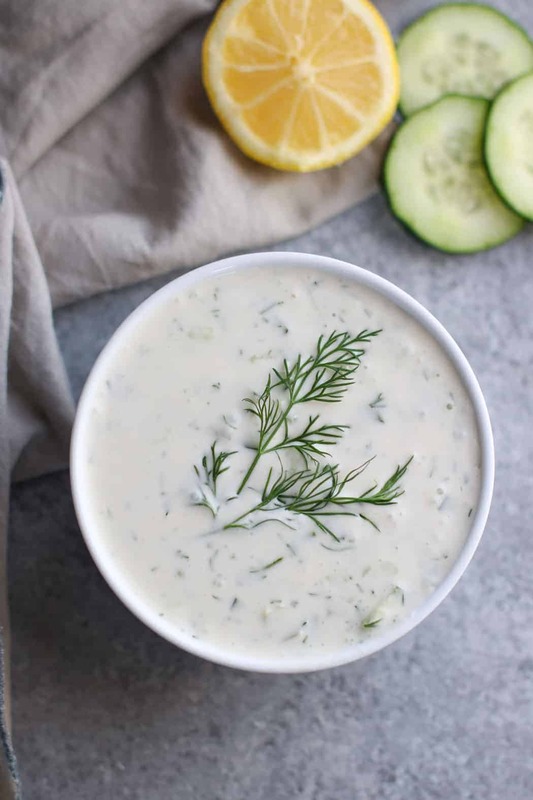 While our Paleo Ranch is quite a popular recipe and might I add delicious, I’m really liking the Paleo Tzatziki Sauce as a creamy salad dressing. It has thinner consistency that works great for tossing salads in. I’m quite the fan of the Greek cuisine! In fact, it may be my favorite of all. Oh wait, curry…I love curry! But anywho, the Greek inspired salad I’ve been enjoying this week is out-of-this-world. Here’s what it’s made of: salad greens of choice, cherry tomatoes, bell peppers, fresh basil & oregano, red onion, kalamata olives, artichoke hearts, avocado, chicken and drizzled with Paleo Tzatziki Sauce. You gotta try it! And if you’re not whole30’ing or you don’t have a need to avoid dairy, I suggest you add a little feta as well as try our Greek Quinoa Salad with the addition of Paleo Tzatziki Sauce. Hey, did you see our One-Pan Greek Chicken Veggie Bake recipe that we shared on PaleOMG’s blog? This week we were guests on PaleOMG’s blog! Woot! We love Juli from PaleOMG. One of our favorite bloggers and someone we truly admire. She’s quite hilarious too. And how nice of her to have us on her blog for not the first but second time! The first recipe we shared was our one-skillet Buffalo Chicken Meatballs, and let me tell you, it was a hit as evidenced the countless number of the buffalo chicken meatball images that we were tagged in on Instagram. 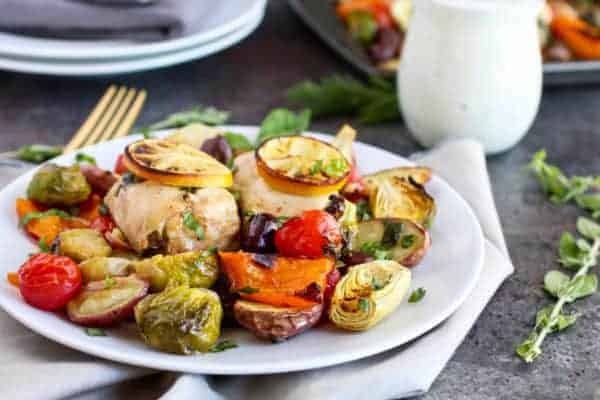 Head on over to PaleOMG to get that recipe and now our One-Pan Greek Chicken Veggie Bake recipe too. It’s super simple and goes perfectly with Paleo Tzatziki Sauce. A fast-and-easy meal for a busy weeknight! What’s your favorite ‘special’ sauce? Comment below and let us know! In a blender, blend together the entire contents of the canned coconut milk. Next, in a bowl combine and mix together all of the ingredient. 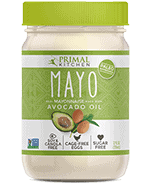 **For vegan-friendly or egg-free, use an egg-free mayo such as Just Mayo. Hi Kathy! You’re going to love the Paleo Tzatziki Sauce. The link is now live: http://paleomg.com/guest-post-one-pan-greek-chicken-veggies-with-paleo-tzatziki-sauce/ Enjoy! Question! Is the whole can of coconut milk blended (I’m assuming to mix the fat) and then take 1/3 cup of that? Or only blend 1/3 cup? You are correct. Because full fat coconut milk tends to separate in the can, I always blend the full can of coconut milk first and then take what I need. Do you know of a good replacement for the coconut milk? I am allergic, but I would love to make this! You can use almond or cashew milk but it will be thinner so I’d suggest using slightly less. I see that you advertise the Tzatziki sauce as egg free. The mayo you recommend has eggs in it, they are just cage-free eggs. I was really hoping to find a dressing my son could use. He is Dairy and egg free. In the recipe we give an egg-free option. Let us know if you have any other questions! They make egg free Mayo. I bought some at Walmart. Yes, that is correct. Egg-free mayo is now available. Thanks for sharing where you got yours! You’re right, egg-free mayo is now available. 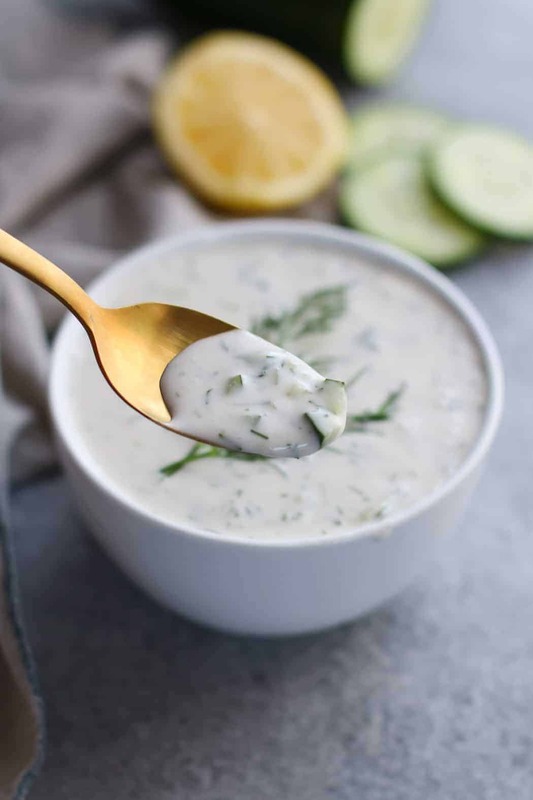 I LOVE this sauce – my grocery store sells coconut cream which is thicker and doesn’t separate so I use that & squeeze the grated cucumber in a kitchen towel to keep it nice and dry avoiding any extra liquid (that would making it thinner). I found it thicken’s nicely after being refrigerated and the flavour enhances overnight as well. Thank you!! Hi Wendy! So great to hear. And yes, I also find that it thickens after setting in the fridge for awhile and the flavor enhances as well. That’s how our Paleo Ranch is too. Delicious! Added extra mayo, dill, garlic, and S&P to my tasting, but so yummy I doubled the batch! How long do you think this would last in the fridge before expiring? I’m going to use this on everything! So great to hear you enjoy this recipe. This would stay good for up to 7 days. Similar to our ranch dressing. Enjoy! My boyfriend and I are lactose intolerant and we always miss having yummy sauces. This was amazing! We drizzled it on pitas filled with veggies and chicken shwarma! Yayyyy! Glad you were able to partake in some yummy sauce – your dinner sounds like it was absolutely fabulous! SOOOOO GOOD! Thanks for this awesome recipe! Maybe side by side I could tell the difference between this and the dairy version, but it tastes like the real thing to me! Amazing…. I would have never guessed…. Yayyyyyyy!!! So happy to hear you loved it. My LO is allergic to dairy and my husband is allergic to coconut. So what could be used as a substitute for the coconut milk? You could try dairy-free plain almond milk or cashew yogurt. Excellent! I ended up using 1tsp of dry dill and it worked great. I also used 2 tsp of lemon juice instead of just 1. I made this with just the coconut milk and it was wonderful. It’s also super easy to make. Great recipe, thank you!!! You’re so welcome! Glad you loved it! I rarely leave comments but I’ve made this at least five times now and you absolutely deserve all the credit for how delicious this stuff is. Thank you for the amazing recipe, I love it!